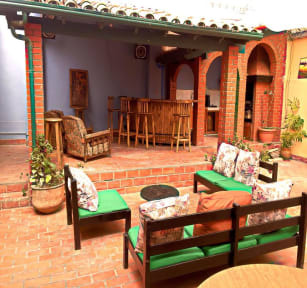 Greenhouse Bolivia is a brand new hostel in the neighborhood of Sopocachi, the most strategically located and hip district in La Paz. We are a Chef Hostel, with an open kitchen where guest are welcome to cook and share recipes. The open patio is a great place to meet other travelers and make plans. We have an in-house Travel Agency, to suit your travel needs. The Greenhouse Experience is our brand, and we offer very affordable destinations and the best advice. The Greenhouse is three blocks away from the Yellow Line cable car connecting Sopocachi with the southern part of La Paz, as well as with El Alto. Sopocachi is the SoHo of La Paz, with a very bohemian atmosphere and interesting, artsy people walking the streets. It has breath-taking views of the city, such as the lookout point in “El Montículo”. In Sopocachi you will find great parks (El Monticulo, Plaza España, Plaza Abaroa), pubs, restaurants, local markets, hospital, police station, banks, laundromats, discotheques that are a few blocks walking distance from the GreenHouse, located in a safe and comfortable neighbourhood. The GreenHouse has 9 rooms in two floors. There are 4 shared rooms and 5 private rooms with double beds. All rooms are shared bathrooms, with seven showers in total. We provide linen. Towels have a small cleaning surcharge. We clean the rooms every day. Our Cable Car Suite has a beautiful balcony, with a view of the city and even a glimpse of the Illimani. The Cable Cars pass overhead, but far enough to afford your privacy. The patio is a large greenhouse, which captures the day’s sunlight and keeps the atmosphere warm, for a beer or nightcap. Free breakfast consists of bread, butter, marmalade and tea, coffee or coca/chamomile infusion. We offer free WiFi in the entire house. We have an in-house travel agency, for culinary tours and other city tours, Lake Titicaca, Tiwanaku, Coroico, Uyuni and great sightseeing spots in La Paz. Don´t be afraid to book tours onece you arrive and save money. Check-in time starts at 11am. Payment types accepted at this property: cash, credit card, debit card (Visa or Mastercard). 24-hour reception, prior coordination with staff. Loved my stay at the Greenhouse hostel! - Great location in the laid-back and safe Sopocachi neighborhood. - Great staff: Sergio is an awesome host, generous with his time, and makes sure that all of his guests enjoy their stay. - Beautiful space: Very clean and comfortable rooms. Perhaps one of the best kitchen facilities I've seen in South America. - Social atmosphere and if you want party vibes you can find them, but it's not a "party hostel." Would happily stay there again. Thank you! 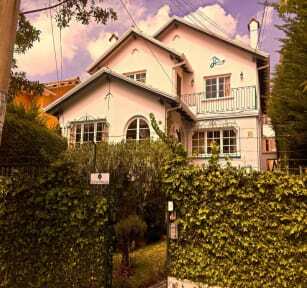 Great location, close to teleferico and 30min walk to town. Good value for money and helpful staff. Greenhouse is a really lovely hostel. The staff are extremely friendly and helpful - i was really impressed by the kindness shown to a traveller having a really rough time. The hostel is located more in the suburbs, but is definitely a winner for a calmer chilled out vibe. Located in a quieter/safer neighborhood, though there’s not much to do in that area. Must take public transportation to get to the touristy section, but keep in mind that section isn’t very safe so it’s nice to be in a better area. Staff are great and very helpful. Kitchen/greenhouse area is nice and relaxing. Would recommend. This a great place to stay in La Paz. We stayed in three different hostels and liked this location best. A little removed from the centre (25 minute walk) the area is nicer. The staff were all very helpful. The rooms were comfortable and the kitchen and social space was great. Lockers in the rooms would be helpful. Breakfast was basic but buffet style so you could eat as much as you like. This was a really nice hostel - Sopocachi is a much nicer area than the centre and it had great cooking facilities, friendly helpful staff and a nice big socialising area. The only slight down side was the breakfast - basically just nescafe, bread and jam - and the bread was pretty stale. Otherwise an awesome place! A solid hostel. Nice place to sleep of a night time after long days seeing La Paz. Local staff were great and super helpful but the more senior staff seemed a bit reluctant to help as much. Bathrooms are strange as the toilets are part of the shower. So someone using the shower means you have to wait to use the toilet and vice versa. Is out of the way from the busier parts of La Paz so be prepared to walk or rely on taxis. Unorganized when I arrived, they relocated me to a shared dorm instead of the private I booked and gave me discount. One of the others in my room had booked an all female dorm and ended up in mixed. The staff was kind and helpful and relocated me the second night to a private room. Hot water wasnt working on the second night. Generally rooms and beds are clean. When I checked out they didnt know how much to charge, couldn't locate any reservation. Property has potential but unorganized. Got here at 17:30 and our room was not available. The previous person had not checked out yet. Eventually this was sorted out. Then the next day the key which is tied to the key ring by a piece of string fell of when the knot came undone. When I went to speak to reception about it saying I needed a new key the manager agressively stated that he was going to have to charge me for losing the key. No problem but the agression pissed me of and the fact that I did not lose it. So pissed off. We arrived at 4am following an overnight flight only to find our reservation was ‘lost’. The staff placed us in a room in the Cathedral hostel across the road where the atmosphere and facilities left much to be desired. During our stay the staff at Greenhouse were generally extremely rude and unhelpful. Most were new and knew nothing about La Paz, and showed no initiative to assist - very unprofessional. The icing on the cake was their attempt to overcharge us at checkout. Would not reconmend.